Any dentist can claim to be a cosmetic dentist, so if you are considering aesthetic dental procedures, such as veneers or a smile makeover, how can you be certain your dentist is capable of creating the best results? Training: Is your dentist trained in cosmetic dentistry? The Las Vegas Institute for Advanced Dental Studies offers postgraduate training to dentists who want to provide the latest and most reliable aesthetic dental procedures. A dentist who studied at LVI knows the best materials, tools and procedures for cosmetic dentistry. Because the dental field – aesthetic dentistry in particular – is constantly evolving, doctors who attend continuing education in aesthetic procedures can bring patients the most recent advances in the field. Experience: How many happy cosmetic clients does your dentist have? Just as an artist’s skill develops with experience, a cosmetic dentist’s ability to create beautiful, functional, lasting smile makeovers also improves with time. Patients should review a cosmetic dentist’s before and after portfolio, ask questions about how long the dentists has offered smile makeovers and even request references before investing in a new smile. Approach: Did the consultation feel thorough and personalized? In a smile consultation, an experienced cosmetic dentist will ask you questions about the kind of smile you want. Bring along photos of the smiles you like best – clippings from magazines or pictures printed from Internet sources will help the dentist design your new smile. Your face symmetry, measurements, and the size of your features will be considered. 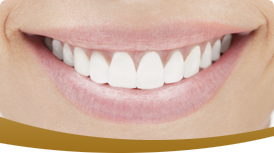 Skin tone also has much to do with the shade chosen for your new teeth. During your cosmetic consultation, your dentist will gather all of this information to develop a treatment plan. Many dentists who regularly perform cosmetic procedures will offer patients a preview of their new smile through digital imaging or wax ups, so ask if your dentist offers this option. Seeing what your new smile will look like can be a valuable asset in your decision. Trust and Care: Are you comfortable with your dentist’s capabilities? Peace of mind is important when considering cosmetic dentistry. Do you trust your chosen cosmetic dentist? How can you tell that the dentist has your best interests at heart? Will you be comfortable with his or her office and team throughout your experience? If you do not feel confident with a cosmetic dentist, you should continue your search. We invite you to learn more about the cosmetic procedures, read about Dr. Holt’s experience. If you have any questions about our services, expertise, or practice, please call us at (817) 488-2273.